Human NRP1, Fc Tag (NR1-H5252) is expressed from human 293 cells (HEK293). It contains AA Phe 22 - Lys 644 (Accession # AAH07533). 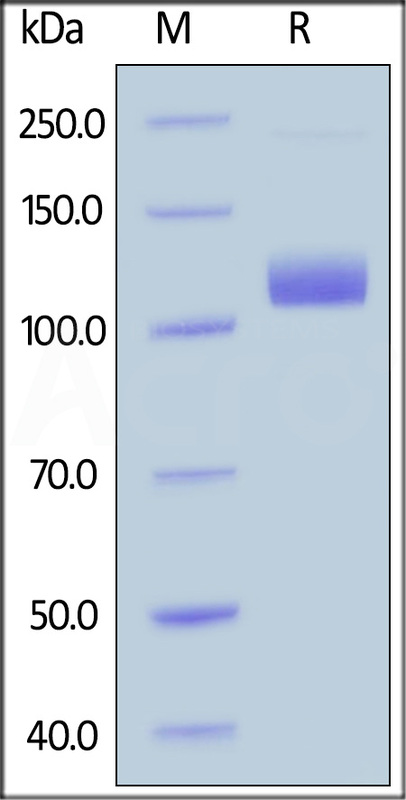 The protein has a calculated MW of 96.5 kDa. The protein migrates as 105-130 kDa under reducing (R) condition (SDS-PAGE) due to glycosylation. Human NRP1, Fc Tag on SDS-PAGE under reducing (R) condition. The gel was stained overnight with Coomassie Blue. The purity of the protein is greater than 90%. Immobilized Human VEGF165, Tag Free (Cat. No. 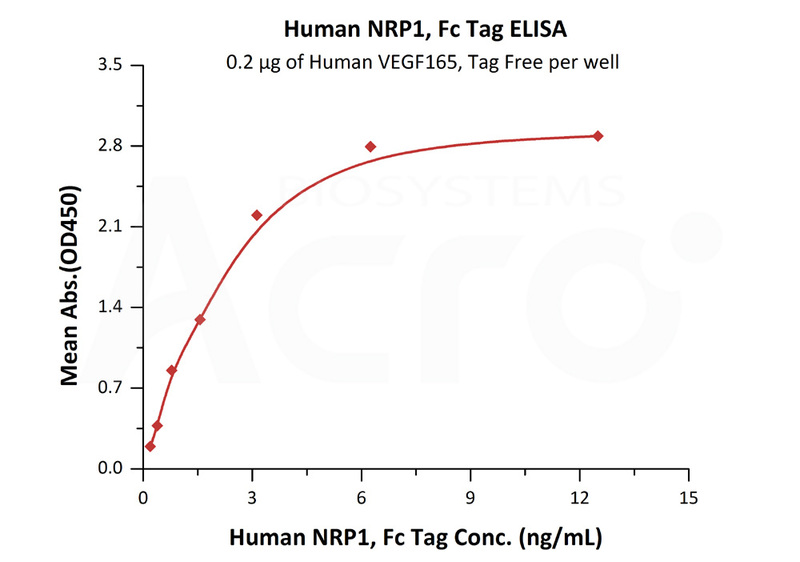 VE5-H4210) at 2 μg/mL (100 μL/well) can bind Human NRP1, Fc Tag (Cat. No. NR1-H5252) with a linear range of 0.2-3 ng/mL (QC tested). Authors: Kerros C, et al. Neuropilin-1 (NRP1) is also known as Vascular endothelial cell growth factor 165 receptor (VEGF165R), CD antigen CD304, which belongs to the neuropilin family. The membrane-bound isoform 1 is a receptor involved in the development of the cardiovascular system, in angiogenesis, in the formation of certain neuronal circuits and in organogenesis outside the nervous system. It mediates the chemorepulsant activity of semaphorins. It binds to semaphorin 3A, The PLGF-2 isoform of PGF, The VEGF-165 isoform of VEGF and VEGF-B. Coexpression with KDR results in increased VEGF-165 binding to KDR as well as increased chemotaxis. It may regulate VEGF-induced angiogenesis. The soluble isoform 2 binds VEGF-165 and appears to inhibit its binding to cells. (1) Tamagnone L., et al., 1999, Cell 99:71-80. (2) Appleton B.A., et al., 2007, EMBO J. 26:4902-4912.